Zug, 4 December 2018. A new survey published by Montana Capital Partners shows that over 90 percent of family offices and institutional investors will either maintain or increase their exposure to private equity. Montana Capital Partners (mcp) carried out its sixth annual investor survey in September, to reveal the investment preferences and appetites of these institutions. The full report is available to download here. 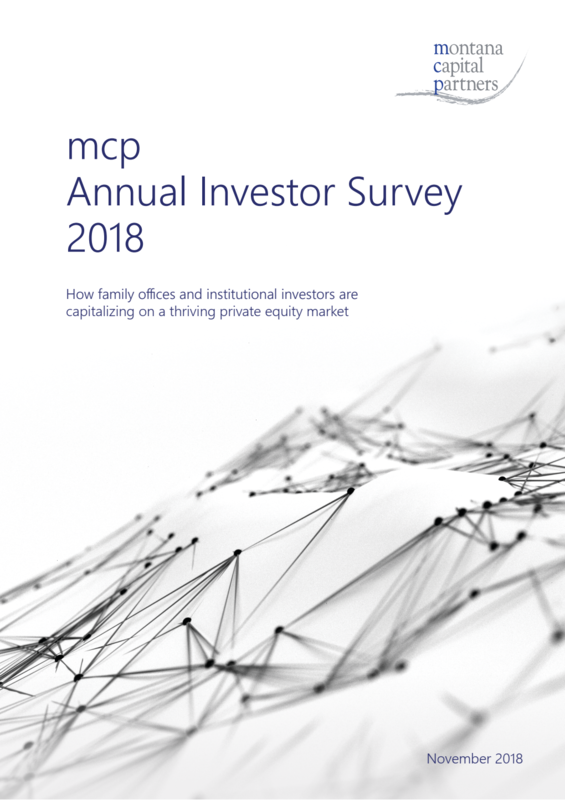 mcp expanded the survey for the first time to also include institutional investors and derived very interesting differences between family offices and such more regulated investors. Private equity continues to play a very important role for all investors: 86% of family offices and foundations report an allocation to private equity above 10%, whereas the majority of institutional investors report an allocation to private equity of 1-5% of their oftentimes very sizeable portfolios. This shows that non-regulated investors are able to profit from larger allocations to private equity. As in previous surveys, mid-market buyout continues to be the preferred investment strategy, with 90% of respondents selecting it as one of the core strategic preferences, followed by secondaries with 55%. 86% of respondents expect the secondaries market to grow further over the next 12 months. Complex secondaries and small secondaries are currently the two most preferred strategies across investor types. 70% responded plain vanilla secondaries deals are very difficult right now, due to high pricing. Investors indicated that their top concern is GPs buying into companies at too high valuations, while also worrying about the impact of the U.S. Federal Reserve raising interest rates. Marco Wulff, Partner at Montana Capital Partners, commented: "Our survey shows just how confident sophisticated investors like family offices and institutional investors are in private equity as an integral part of their investment portfolios". "It was very interesting to see how big the difference is in private allocations between family offices and foundations, and regulated institutional investors. While close to 60% of all family offices invest more than 10% of their capital in private equity, only 23% of regulated investors reach such an allocation." highlights Christian Diller, Partner at mcp. "We are particularly pleased with the very high number of respondents to this year's survey, comprising many of the leading family offices and institutional investors worldwide. This makes the results of our survey particularly relevant as an indicator for how investors approach the asset class in the current market environment" adds Eduard Lemle, Director at Montana Capital Partners. Family offices and institutional investors globally were surveyed by email in September 2018. A smaller group of investors were then interviewed by telephone to give insight into the results.